#10 Arizona State @ #16 California – Arizona State shuts out Cal 5-0 to take game two and the series. #13 UCLA @ #22 Stanford – UCLA takes game two 4-1 behind Trevor Bauer’s 17K’s to tie the series. Sam Gaviglio – RHP – Oregon State – Jr. 6.2IP 7H 5ER 0BB 8K. Sonny Gray – RHP – Vanderbilt – Jr. 7IP 5H 3ER 4BB 7K. (W, 8-2). 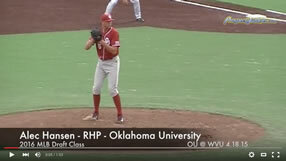 Michael Rocha – RHP – Oklahoma – Sr. 9IP 8H 2ER 0BB 5K. Austin Kubitza – RHP – Rice – Fr. 4.1IP 10H 4ER 1BB 3K. Andrew Chafin – RHP – Kent State – So. 5.1IP 3H 4ER 5BB 8K.